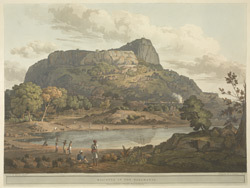 This aquatint was taken from plate 12 of Henry Salt's 'Twenty Four Views in St. Helena, the Cape, India, Ceylon, the Red Sea, Abyssinia and Egypt'. Salt visited Rayakottai in Tamil Nadu on his way to the Cauvery Falls. Viscount Valentia George Annesley wrote of its importance as a point of communication between Mysore and the Carnatic: "[Governor General] Lord Cornwallis ... had the fortifications strengthened. At present they consist of the hill, whose top is only approachable by a narrow flight of steps, and a fort at the bottom where are very comfortable houses for the officers. The scenery is wild and abrupt, consisting of rocky hills, with woods and jungle between ... the climate is so moderate, that every kind of fruit and vegetable may be reared in a degree of perfection that is unknown on the sultry plains around Madras."